Sixty years after the Supreme Court decision Brown v. Board of Education integrated the nation’s classrooms, black and white students still largely attend different schools, even during their earliest years. 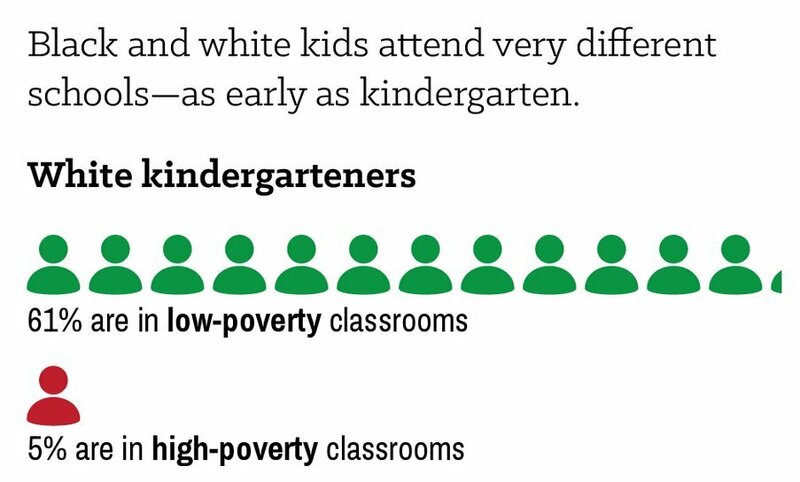 A recent analysis from liberal think tank Economic Policy Institute (EPI) outlines the severe segregation that exists among kindergarten classrooms. 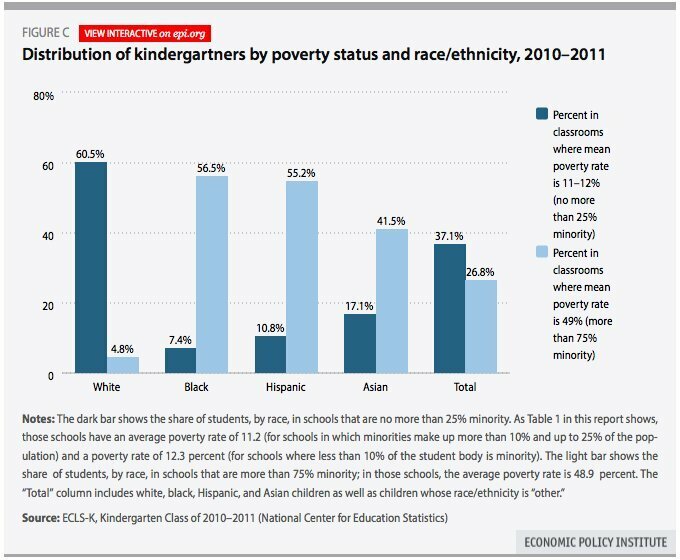 The analysis, which used data from the National Center for Education Statistics’ Early Childhood Longitudinal Study, Kindergarten Class of 2010-11, looked at kindergarten classrooms through the lenses of race and income. Perhaps unsurprisingly, EPI found that while white kindergarteners largely attended classrooms with fellow white students living above the poverty line, black students were much more likely to be in classrooms with low-income peers of color. According to the study, the phenomenon not only denies American students the intangible benefits of learning in more integrated classrooms, but it perpetuates the achievement gap between students of different racial and class backgrounds before they barely have had an opportunity to start their educations. “Research makes fairly clear that racial integration – enabling white students to learn together with black and Hispanic students, and vice versa – benefits all student groups," the EPI report, written by researchers Emma Garcia and Elaine Weiss, states. "Unfortunately, race is not now, and has never been, decoupled from socioeconomic and other differences." Two graphs put together by the institute detail the problem. The first graph shows the share of students in high poverty classrooms, by race. 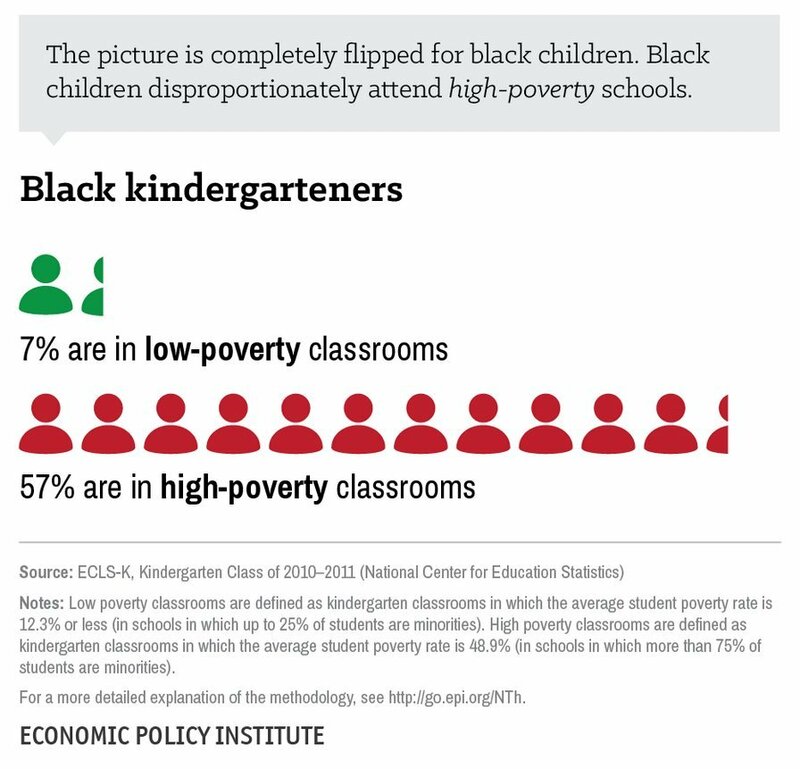 The second graph displays what the problem looks like for black students, specifically. As the below graph shows, black students learn in high-poverty classrooms at much higher rates than their white counterparts.